Assembled imported internal terminals made of ultra-pure copper material made in Germany, the surface plating 24k gold, lockable, superconducting, non-magnetic, the new RCA terminal, the center stylus is the use of expensive German precision equipment, Seiko to create In the middle there are a number of unique, patented stylus bulges that enhance the floating point. Its signal transmission characteristics are much higher than those of other RCA terminals, with extremely low attenuation. Shell with special expensive non-magnetic alloy material to ensure long-term use of quality will not decline. 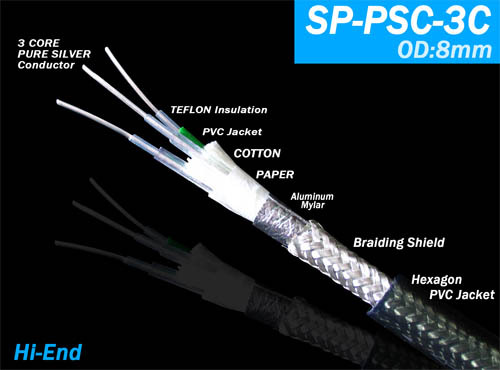 The wire is composed of three-core independent reinforced braided structure and my Teflon dielectric. The conductor is made of 99.99999% large crystal pure silver in Germany, which can effectively improve the accuracy of the communication speed and sound suspicion, strong penetrating power and extremely wide bandwidth , With HI-FI-level signal transmission level, to reproduce the details of all the weak news of the music; can make the sound of audio equipment more sweet, natural, delicate, high frequency more transparent, crisp, low-frequency retractable more comfortable, more music The sense of presence, to enhance your audio equipment, the potential of the original potential replay level. 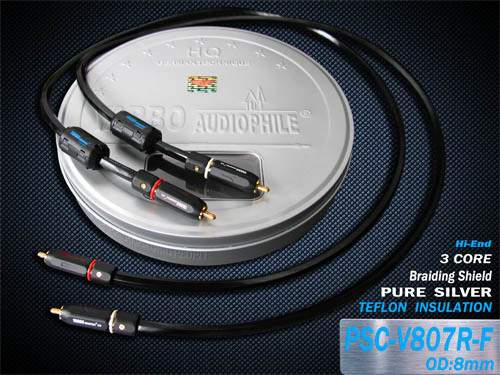 Germany Yabo <YARBO AUDIOPHILE ®> PSC-V808R-F sterling silver signal line (hereinafter referred to as Yabo V808R) is the author ever heard the most expensive price, but the most effective sound, the most magical silver! Abacus 808R sterling silver line with its mellow, moist characteristics completely subversive fans for cheap silver line "thin sound, grab the ear" impression. The single player I heard countless times, "a water across the world" in the "about dusk after", Abacus V808R has made the author stunned. The accompaniment of the erhu texture is very strong, pipa exquisitely carved, Chen Jieli beautiful voice seems to be surrounded by a layer of noble, and warm air, the tooth can be so smooth and original, the singer's mouth shape clear and delicate and highly embossed, the whole Music performance is also filled with an unspeakable romantic and rustic atmosphere, everything changed unusually supple and natural, so that this song sounds a new, unprecedented feeling. After a song, I can judge, or even think that the Yabo V808R will be one of the most competitive price of 3,000 yuan wire! As you enthusiasts (including the author included) are more unfamiliar with the brand <YARBO AUDIOPHILE ®>, the author in this example first briefed on it. YARBO AUDIOPHILE ® was originally a famous brand manufacturer specialized in producing special wire and fever wire in Germany. It has more than 30 years of experience in manufacturing and manufacturing special high-grade wire rod in different industries for European and American suppliers and has accumulated rich experience. For the audio industry fever line agents OEM, ODM for many years, a wide range of products, all the wires have been carefully, unique design and trial and error was introduced to the market. Germans are always known for their rigor and precision. Therefore, its excellent metalworking also laid a solid foundation for the excellent performance of the wire. Then back to Yabo V808R sterling silver signal line, according to the information obtained, Yabao V808R wire for the three-core independent enhanced braided structure and special Teflon dielectric composition, and the conductor made of 99.99999% large crystal pure silver, with the Ya-Fort <YARBO AUDIOPHILE®> Exclusively developed 24K gold plated, lockable, non-magnetic RCA terminal for enhanced messaging speed and accuracy with exceptional bandwidth. 7N (that is, "7 9") copper we hear more, but 7N sterling silver will be what kind of realm? In the general fancier's impression, the higher the purity of the wire, the better the high-frequency response, but the sound may also be slightly "brilliant." But Yabo V808R sterling silver signal line with the most authentic results but to prove to you: the higher the purity of the conductor, the more mellow sound, the more smooth and cleaner! 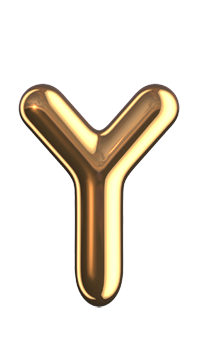 After several days of audition, the author found that the cable designer of the Aalborg V808R signal line school sound, the IF to the high-frequency passage is indeed under the hard work, resulting in the system joined the Yabo V808R sterling silver signal line, the overall The effect of showing thick, warm, slippery, elegant Qing sound. Replay RCA Rubinstein Chopin Nocturne (US version) No. 9 piano works, the past use of copper to play the piano heard the touch of the "square sense", once after the Abacus V808R seems to be rounded after the corner Of the "sense of the box" has become a "sense of grain", a bead Yuerun, crystal clear and transparent hanging in the sound field mid-air, and more "murderous" is also in the ups and downs of the piano sound is also flowing silky silver Gas, the sound of the piano like a moonlight gently sprinkled on the calm sea, sparkling glittering, simply make people hear ecstatic, completely intoxicated in the quiet, quiet and full of reverie music mood among them. This is a three thousand yuan price band is very valuable performance, I also can not help but have created a rapid impulse! A little more must be emphasized to everyone that, because the Yabo V808R sterling silver signal line has a docile, smooth, non-stimulating innate traits, so I put the Yabo V808R, the pre-level volume controller can be large One or two squares will not feel the slightest bad feeling (about 11 o'clock or so). As a result, with the level and the amount of information is not lost at all, as the volume controller increases, the majestic dynamics will follow the listener! Find a "Golden Banquet" in the "no drama" as a demonstration, in the large volume of the sonata, first found the sound field even more than the impression of the sound of some of the silence, the gongs, , Explain the details vivid! Strike bass is more shocking! Drum stick percussion Hand knife off, the intensity like a mountain split stone, lightning speed, drum skin resonance is "obvious to all", the scene is lifelike, but no oppression or uncomfortable feeling. Ya Bao V808R low-frequency thickness, weight and analytical skills are the leader in the silver line, completely changed the silver line in the past, "no bass" criticism. As we all know, wire school sound is the most basic and easiest way to adjust the system, but also for the fever level sensitive equipment, change the line effect is also significantly like a replacement machine. Neither do experienced enthusiasts and gamers (especially device commentators) test and listen to recordings using only one or a pair of wires, most of which have more than two pairs of signal and speaker cables on hand for tuning out Like the sound. If you are ready to purchase more signal lines for reference and calibration purposes, I sincerely advise you on the Yabo V808R "7N" sterling silver signal cable, which is absolutely sweet, delicate, smooth, noble and attractive It is worth to fans included in the "hunting" range.